Build your dream home on this .68+/- acre lot in the private mountain community in Notla River Estates. You’ll enjoy the beautiful long range mountain views and rolling hills. The septic is installed and ready to go. The community has paved roads and is ready for your builder. In no time at all you and your family and friends can begin enjoying all the gorgeous seasons changing from your new home in the mountains. Gorgeous gated custom estate nestled on 126.26 +/- acres on Shoal Creek Road. As you drive up to the private secure entrance you will instantly relax as you pass the pastures. There is a grand entry with a custom stairway to the second floor. The kitchen has custom cabinetry throughout and a cooking island with hammered copper sink. The great room is perfect for large gatherings, with its custom bar with amenities, or relaxing in front of the fireplace. The master bedroom is a private retreat with wet bar, gas log fireplace and sitting area. The master bath has a jetted tub, two person shower, island and lots of cabinet space. The his and her closets hosts a private laundry room. The privacy of the bedrooms, baths and media/exercise room upstairs are a plus. The heated four car garage has finished bonus room and potting shed. Visit the horses in the heated three stalled barn with tack room. There is a large concrete entry hallway with ceiling fans and attached maintenance room. There is also a work shop with two separate office areas. Property includes a stocked trout pond. This is a brand new mountain community, with level to gentle home sites. There are only 14 home sites in Ranger Ridge. The property is builder ready with underground utilities, community water and roads to be paved. You won’t want to leave after you’ve seen these fantastic long range views. Only a few miles from USFS and Lake Hiwassee, so you’ll need to bring your fishing pole. Just think mountain living with the convenience of town. Don’t miss seeing this great property in a great area. The price has just been reduced on this exceptional mountain chalet with panoramic views! You’ll enjoy the many upgrades in this 3 level home. The main level has a spacious dining and kitchen with upgraded appliances, a stone fireplace with gas logs, hardwood floors and tongue and groove ceiling, a bedroom and bath. The oversized master is enclosed with glass doors to enjoy the view upstairs and features a cozy sitting area. The finished basement features a gas fireplace, bath, office guest space and den. With this home you will have plenty of room for entertaining family and friends. Call Kathy for more information. Just Reduced. Come enjoy this amazing mountain gated community and this 2 bedroom 3 bathroom home on 1.78 +/- acres. Take a stroll through the wooded back yard that leads to a creek. Family coming to visit is not problem with the finished lower level that has a great room, bonus room, mechanical room and bath. Take that glass of iced tea out on one of your two covered porches and breathe in all this wonderful mountain air and take in all the wildlife around you. This is a must see. Come take a look at this beautiful 2 bedroom 2 bathroom Ranch Style Cedar Home with Bonus room that can be used as another bedroom. There are oak hardwood floors in the livingroom and kitchen with tongue and groove ceilings in the greatroom. This home is situated on 4.29 +/- acres in the lovely gated community of Wildcat. You’ll be just 5 miles from town and convenient to the John C Campbell Folk School, Tri County Community College and the hospital. The furnishings are also negotiable and priced at $189,000.00 this home is too good to pass up. Call Kathy today to see this lovely home in the mountains. This Private Estate has amazing views all around. 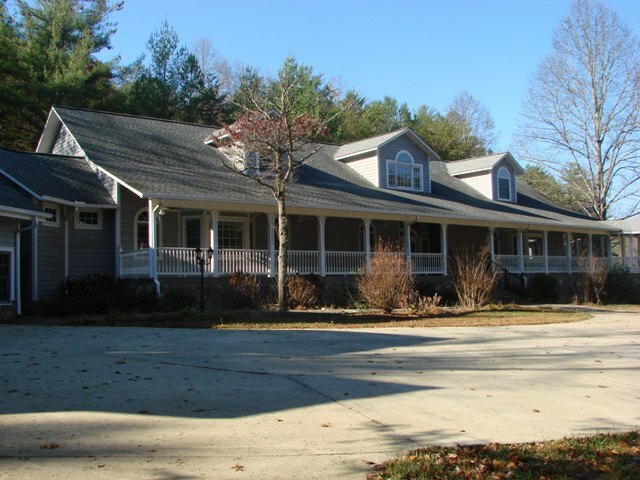 Upscale 3 bedroom 3 bathroom home with 5.58 acres +/- of pasture and woods. This Home features a Gourmet kitchen with Hickory custom cabinets and Floor to Ceiling Stacked Stone Fireplace. The Open Dining area opens to sunroom & screened porch. There are Two Master Bedrooms and an Additional Bedroom and Bath. The Laundry Room has a walk-in Pantry. Beautiful Open Great Room, Hardwood Floors, and Outside there is a large 20’x40′ workshop. Call Kathy for more information on this great home.